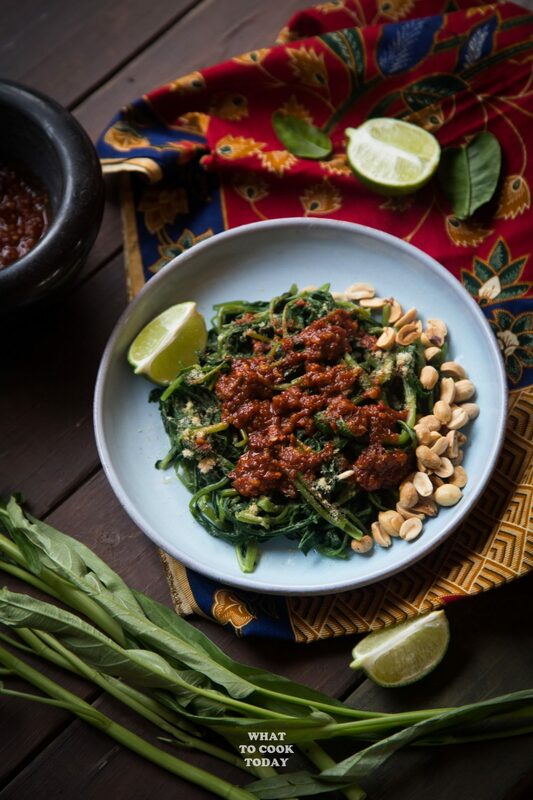 Water spinach is blanched and then topped with spicy sambal packed with umami flavor and aromatic herbs. Lombok is one of the beautiful islands of Indonesia in case you have never heard of it. I know many people heard of Bali, but many have no clue about all the other islands in Indonesia unfortunately. I’ve heard about the beauty of Lombok, but I’ve never been there myself. The culinary of Indonesia is also very diverse from island to island. I grew up in Medan, which is located in the island of North Sumatra and pretty familiar with the culinary culture there. 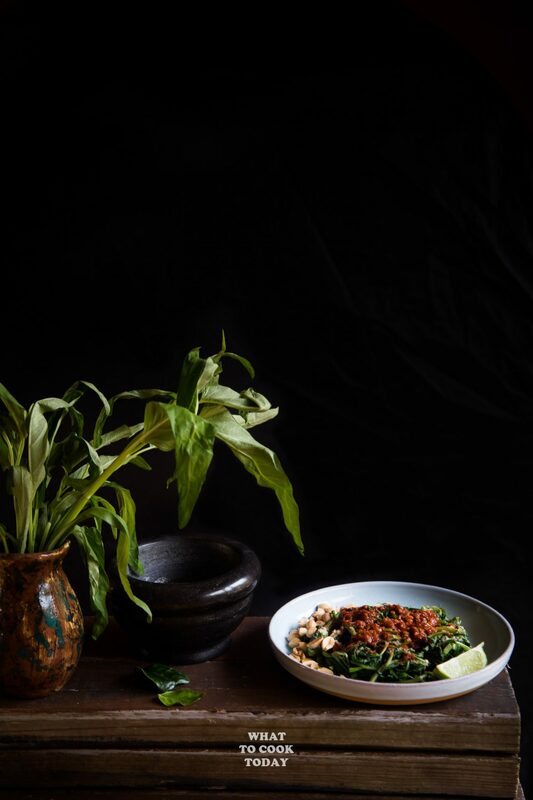 I can’t say I’m familiar with all the culinary traditions across Indonesia but I’m still learning as much as I can. 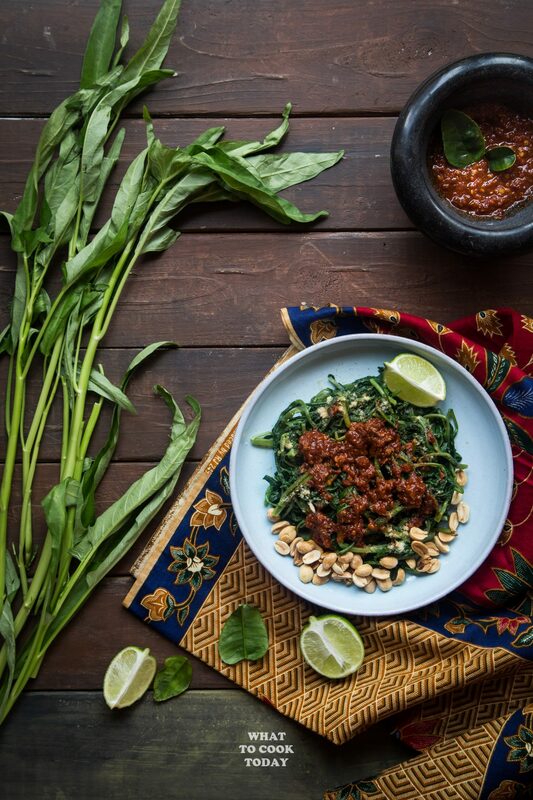 Water spinach or morning glory is known as kangkung in Indonesian language. It is not so commonly found in local grocery stores here in the U.S., but you will definitely find it at Asian grocery store. 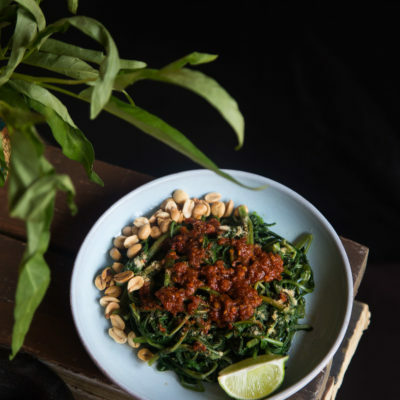 If you must substitute, use other leafy vegetables like regular spinach. 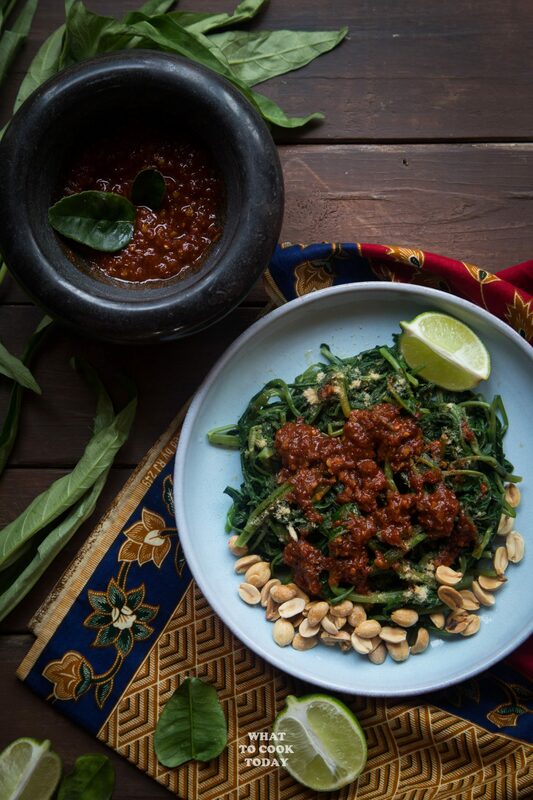 This spicy water spinach salad or what they call plecing kangkung in Lombok is loaded with flavor. 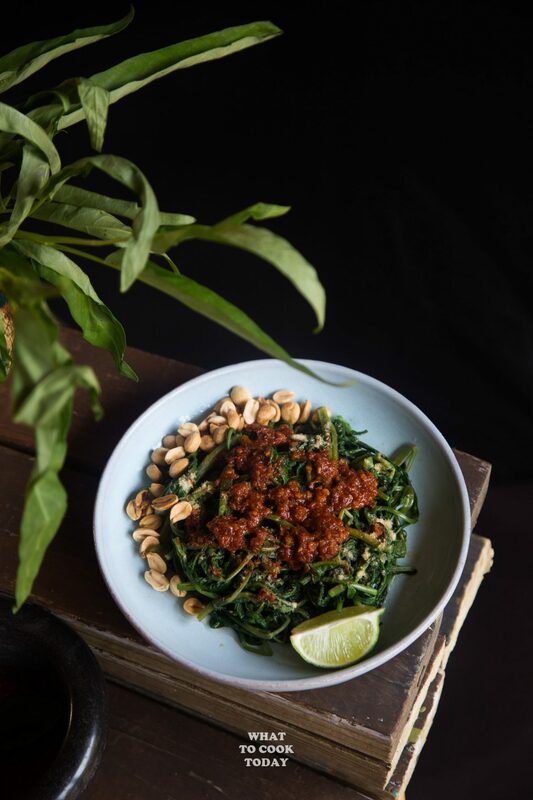 The water spinach is blanched and then dress with the spicy sambal that is packed with umami and aromatic herbs and coconut flavor. I love the spiciness and sourness. It is one terrific combination! 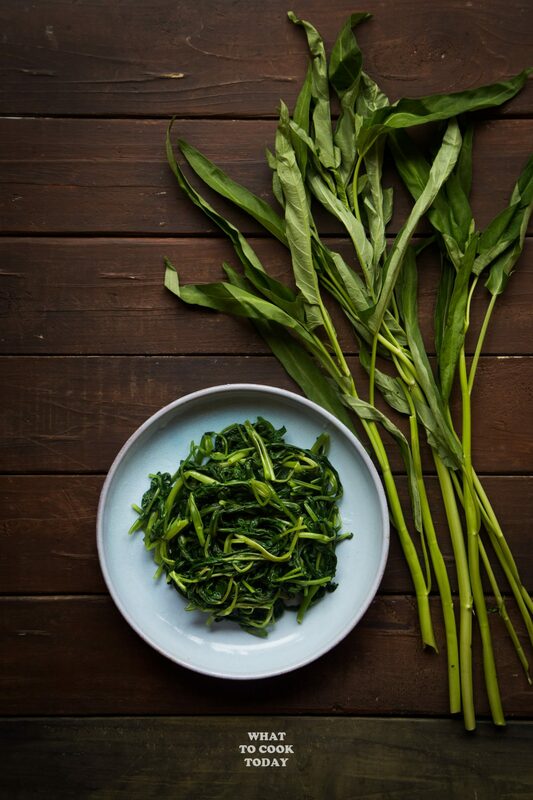 The kangkung didn’t look all that “perked up”. It’s my fault! I’ve kept it out for too long because of the photo shoot! eek! !